A large explosion has rocked a chemical plant in the town of Paterna in Valencia, Spain, the local fire department said. A video of the blast shows a huge blaze and plumes of smoke rising from the building. The blaze was later confirmed by the local fire department. The plant reportedly works with chlorine, a toxic gas that can cause damage to the respiratory system, eyes, and skin. The flames were up to 15 meters high, according to El Mundo. The news outlet also noted that apparently there were several explosions. 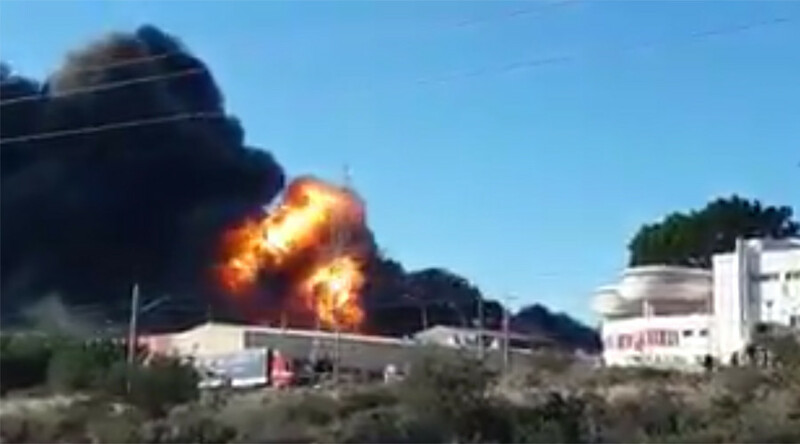 Workers at a company located next to the chemical plant told ABC Spain that after they heard the explosion, they went out onto the street and saw "flares, more explosions and fireballs." Classes at nearby schools were suspended due to the fire, the outlet reported, adding that the population was advised to stay at home and close doors, windows and ventilation systems. The mayor of Paterna, Juan Antonio Sagredo, said that the fire is already under control. The plant where the fire broke out reportedly belongs to the Indukern company, which manages the “distribution and sale of pharmaceutical APIs, ingredients for animal nutrition, ingredients for foodstuffs, flavors and fragrances and industrial chemicals,” according to the company’s website.